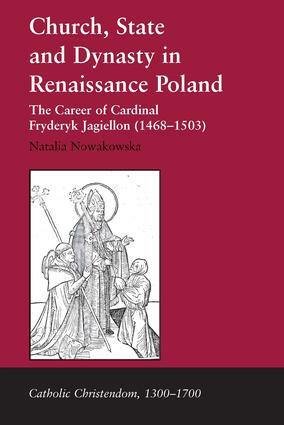 This book provides the first comprehensive analysis of the career of Fryderyk Jagiellon (1468-1503) arguably the most powerful churchman in medieval or early modern Central Europe. Royal prince, bishop of KrakÃ³w, Polish primate, cardinal, regent and brother to the rulers of Hungary, Poland, Bohemia and Lithuania, Fryderyk was a leading dynastic politician, diplomat, ecclesiastic and cultural patron, and a pivotal figure in three Polish royal governments. Whereas Polish historians have traditionally cast Fryderyk as a miscreant and national embarrassment, this study argues that he is in fact a figure of fundamental importance for our understanding of church and monarchy in the Renaissance, who can enhance our grasp of the period in a variety of ways. Jagiellon's career constitutes an ambitious state-building programme - executed in the three spheres of government, ecclesiastical governance and cultural patronage - which reveals the multi-dimensional ways in which Renaissance monarchies might exploit the local church to their own ends. This book also offers a rare English language insight into the development of the Reformation in central Europe, and an analysis of the reigns of Kazimierz IV (1447-92), Jan Olbracht (1492-1501), Aleksander (1501-6), Poland's evolving constitution, her foreign policy, Jagiellonian dynastic strategy and, above all, the tripartite relationship between church, Crown and state. Contents: Series Editor's preface; Introduction; Towards renaissance monarchy? : The Jagiellonians and the Polish crown,1386-1492; 'Supremus consiliarius huius regni': Fryderyk Jagiellon's role in royal government; 'Reformanda reformare': Fryderyk Jagiellon and the Polish church; 'Imperiun sine fine': Fryderyk Jagiellon, image-making and propoganda; 'Cardinalis Cracoviensis': Fryderyk Jagiellon and the Papacy; 'Vita cardinalis': Fryderyk Jagiellon's legacy in Poland 1503-35; Dynastic bishops and cardinal-ministers: Fryderyk Jagiellon in European context; Conclusion; Bibliography; Index. Natalia Nowakowska is Tutor and Fellow in History at Somerville College, University of Oxford, UK.